As I journeyed home to DC during rush hour, my car came to a standstill before the turn onto Rock Creek Parkway. Waze reported, “There’s been an accident,” in its cybernated voice before rerouting me through the city. Zipping my way down 24th Street, my car screeched to another standstill as an ambulance attempted to zig zag through lines of heavy traffic before eventually stopping on the corner of my exit, next to a stunned cyclist who had been grazed by a car. I passed a total of 3 accidents in my attempt to make it home. No doubt, this is a normal commute for many professionals in the DC area and a daily exercise in patience, fear, and forgiveness. “Just breathe,” I thought to myself as I dialed my husband to tell him I’d be late getting home. Professionals have been looking for ways to de-stress, center themselves, and breathe long before the office zen gardens and 1960s Mad Men daylong happy hours gained popularity. So how exactly are professionals squeezing in opportunities to de-stress and unwind these days when mobile technologies allow us to be connected at all times? How the heck do we disconnect? Pink Noise – I’ve had several conversations recently where the power of pink noise has been discussed. Most of us are well aware of the use of white noise, but apparently there are many different “colors” of noise that carry different properties that allow an individual to feel focused, sleepy, relaxed, energized, or calm. Pink noise is used to help with productivity and concentration, so give it a whirl if your Spotify playlists are too distracting. There are a number of pink noise apps you can download, or listen to this recording of pink noise on YouTube. The 5 Minute Dance Break – I first heard about the 5 Minute Dance Break from a friend who was attending Mama Gena’s School of the Womanly Arts workshop. The 5-minute dance break is an opportunity to get up from your desk at one time every day and dance uncontrollably to the energetic song of your choosing. The goal is to let go of all your inhibitions and move. Even if you’re in a cubicle, maybe your daily dance break will inspire your neighbors! The Noon Mantra – Do you have a powerful mantra that you’ve created? 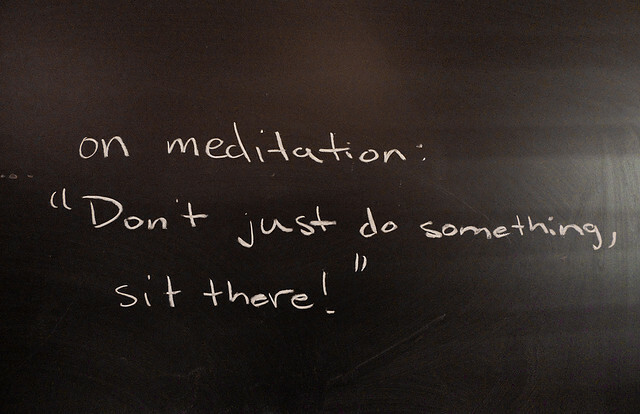 If so, memorize it and set a daily calendar appointment to sit and reflect on that mantra, concentrating on your breath. You can also write several mantras you wish to remind yourself of and write them on index cards. Leave them in areas that you frequently visit – your desk, a drawer, your car’s dashboard. If you don’t have time to create your own, you can download the Spirit Junkie mobile app and receive a new daily mantra sent to your cellphone. Gratitude Journal – Keeping a gratitude journal is a powerful way to reinforce a positive mindset – and it doesn’t have to take a lot of time. Maybe you’ve heard about gratitude journals from Oprah or spiritual leaders. Your journal can be something as simple as writing down 3 to 5 things you are grateful for at the end of the day (or throughout the day) to remind yourself of what has been given to you. There’s an app to keep this Gratitude Journal too, of course. Next time you’re feeling panicked or stuck in traffic, try one of these techniques to unwind or refocus. What are your techniques for de-stressing?